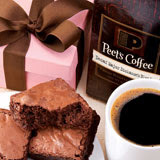 It was almost ten years ago that I was introduced to Peet's Coffee and Tea. Back then I was a typical starving college student at UCSB and had just returned from a year abroad. In the year that I was gone, Peet’s had arrived in Santa Barbara, and my sister Jessica and her hubby Bryan had become addicted to the stuff. They had recently relocated two hours north of Santa Barbara and no longer had access to Peet’s on a regular basis. So, although I did not usually drink coffee, I became their supplier. Each time I went to visit them, I would bring a pound or two of Peet’s coffee beans in exchange for my sister’s homecooked meals. I’m not even sure how it happened, but somewhere along the way, I changed from a simple supplier of coffee to a Peet’s coffee drinker.